You are looking at pre-owned Lot of 8 HASBRO Glo Worms from the 1980s. There are a few doubles. All the glo worms show wear, have scratches and are missing paint. The 2 on the far right are in the best condition. 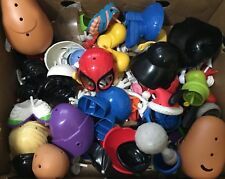 Mr Potato Head Crazy Style w/ Original Box by Playskool 1994 COMPLETE! PlaySkool 2006- Mr. Potato Head "Parts & Pieces" Pirate Accessories Kit-New!! A galaxy full of adventure awaits with STAR WARS Jedi Force C-3PO & R2-D2 Playskool Heroes HASBRO Droid 2pk R2D2 C3P0 ! Theseare the droids you're looking for. Playskool Pop-Up Shape Sorter Baby Toddler Learning Toy 18+ Month NEW! Vtg 1980s Playskool Snugglebumms Princess Snuggleina w/ Purple Skirt 6"
Hello, up for sale is a vintage Playskool/Hasbro Snugglebumms Princess Snuggleina. She is in very good condition with some minor wear including some minor paint wear and some minor marks. STAR WARS Jedi Force SPEEDER BIKE with LUKE SKYWALKER Playskool Heroes HASBRO set features a poncho-clad Luke and his one-person pull-back racer-style bike. STAR WARS Jedi Force JABBA'S PALACE RESCUE PLAYSKOOL HEROES Hasbro VHTF 6pk set is, as the title says, a six-pack of characters. One of which is a solid lump. Have fun with that!! 1988 PLAYSKOOL PINK GLOWORM GLOW GLO LIGHT WORM PLUSH DOLL WORKS!! 1988 Bear Friends by Playskool 17''Tall .machine washable & Dryer Safe NEW.